Want to jump aboard the smartwatch revolution but not yet ready to dump your traditional timepiece? 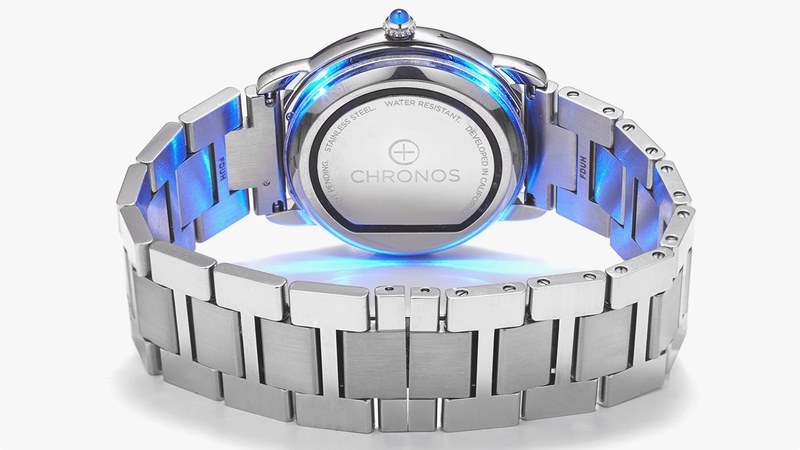 Chronos might just be the device you've been waiting for. Chronos is a discreet, coin-sized, device that sticks to the back of a regular watch – its makers claim it will fit 80% of all the watches currently on sale –that adds smart features. Those features include notifications and activity tracking. With the former you can be updated on your smartphone's activity by way of vibrations and LED lights. You can use the companion app to set different colours for different alerts - blue for texts, red for incoming calls and so on - and you can even dismiss alerts by touching your dumb watch's face. You can also use the app to set up gesture controls – configuring taps and swipes to carry out various commands such as music controls and photo taking. Activity tracking extends to step counting, and a wearer's progress is made visible through the LEDs. It's not the first smart accessory idea for a regular watch that we've come across - Montblanc's e-Strap packs a 0.9-inch monochrome OLED touchscreen, which sits on the underside of the wrist. The band syncs with smartphones to show notifications, and doubles as a fitness tracker using an array of accelerometers. However - Chronos is a lot more budget friendly as pre-orders have opened at $99. It comes with a wireless charger and the battery life is touted at 36 hours.